Since the mid-1970s SAS has been helping organisations turn large amounts of data into knowledge they can use in their day to day operations. The combination of Smart Vision’s delivery and support expertise coupled with SAS’s innovative software products and its commitment to research and development investment (SAS invests 25% of its revenues into R&D) brings a new dimension and energy to the well-established value proposition. 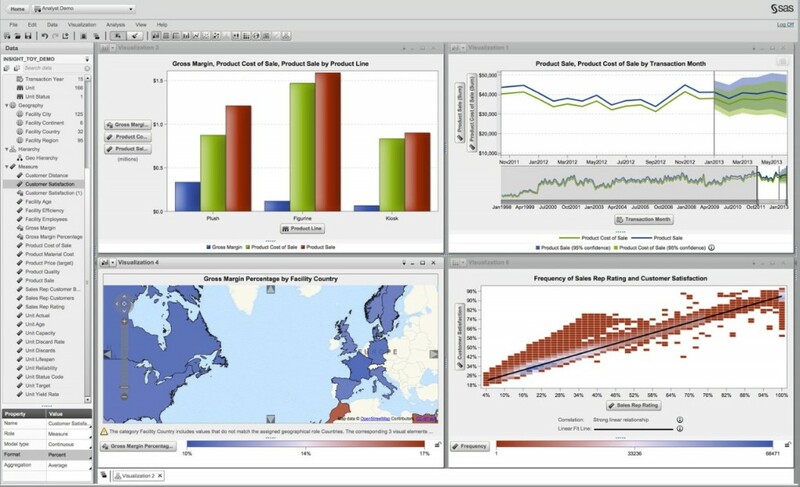 SAS® Visual Analytics brings the power of advanced insight to business users, enabling you to visually explore data quickly to see patterns and trends, and identify opportunities quickly and easily. With SAS® Visual Analytics you can enable colleagues across your organisation (both large and small enterprises) to use advanced analytics. With SAS Visual Analytics, users of all skill levels can conduct fast, thorough explorations on all available data. Discover your best options and make more informed decisions, without the need to engage in coding. Answer complex questions faster – SAS® Visual Analytics uses in-memory analytics to provide extremely rapid output which means that users can quickly identify areas of opportunity or concern, even amongst very large data volumes. Enable collaboration and information sharing. Encourage dialogue around your organisation’s data by making information easy to get hold of, be that through Microsoft Office applications, mobile or the web, whilst at the same time maintaining governance of the underlying data and security. Deliver self-service capabilities across your organisation. 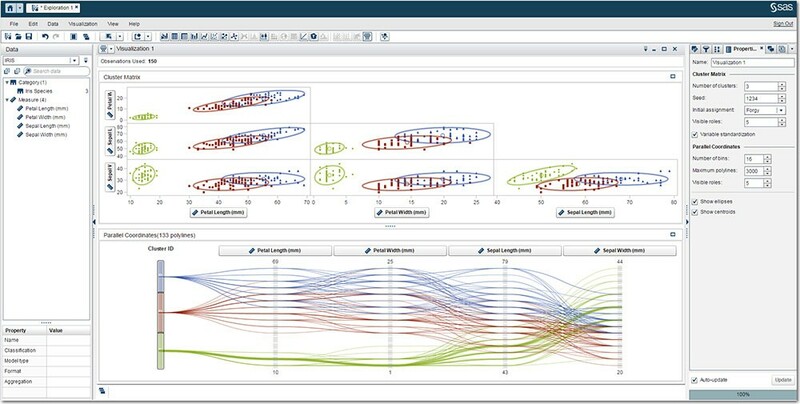 SAS® Visual Analytics allows many users to visually explore and analyse huge volumes of data – all at the same time. This gives users across multiple departments and business functions an unprecedented means to reveal new insights and solve nuanced problems more quickly. Quickly uncover the usefulness in your data, regardless of data volumes, and use it to gain competitive advantage. SAS® Visual Statistics combines industry-leading analytics with a powerful in-memory engine and an intuitive interface that allows users to explore data, build descriptive and predictive models on data of any size. Get precise answers from diverse data. Quickly surface insights that would otherwise remain obscured in stores of data. SAS® Visual Statistics combines powerful, predictive analytics with visual data exploration capabilities in a single, interactive environment. The outcome is that Business analysts and statisticians can do more with data than ever before. Develop more models more quickly and greater applicable accuracy. Run your models in minutes or seconds within the SAS multicore processing environment. Build models to target specific groups or segments. Run multiple scenarios simultaneously. Ask more what-if questions. All using data volumes that would not have been practical previously. Make data scientists and statisticians more central and productive asset in your business. Build in agility in a big data environment, by leveraging in-memory processing. Multiple users can customize models – by adding or changing variables, removing outliers, etc. – and quickly see how those changes affect model outcomes. You get greater productivity from your analytic talent, and greater value from your analytics. SAS Forecast Server provides and unrivalled, sophisticated platform for quickly developing and using accurate forecast models. Generate large volumes of high-quality forecasts quickly and automatically – no need for human intervention (unless that is what you want). Streamline your forecasting processes so you can focus efforts on the most important, high-value decisions. Minimise the risks of personal bias and strongly held beliefs. Generate trustworthy forecasts – automatically. That means less manual intervention, which reduces the chance that organisational politics or personal agendas will dilute the value and usability of forecasts. Get easy access to powerful forecasting techniques. An easy-to-use Graphical User Interface gives you the power of SAS forecasting without having to write code. The software also provides a batch environment that gives advanced users access to an even fuller set of capabilities using the SAS programming language. Plan more effectively for the future with almost unlimited model repository providing models for a wide range of behaviours. You can test what-if scenarios to determine the likely impact on your forecasts. Account for both planned and unplanned events. And mine, segment and visualize data interactively.